Pros: Terrific acting. Great set design with a stunning transformation. Cons: More a word of warning: lighting and sound effects are sometimes harsh and unpleasant, but they do serve a purpose. 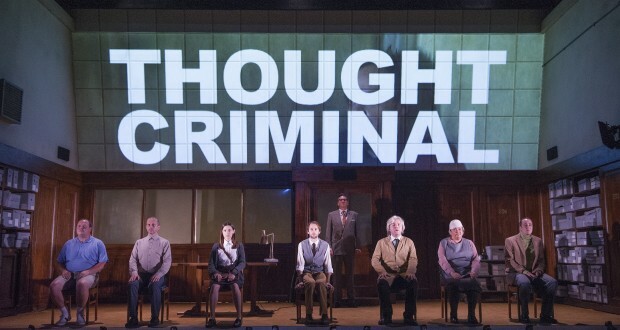 1984 is a razor-sharp adaptation of Orwell’s postwar satirical novel. Tackling an iconic book that depicts a complex and richly imagined world, set forty years into a future that for us is now thirty years in the past, is no mean feat. Hats off, then, to Robert Icke and Duncan Macmillan, who have clearly thrown all their know-how into producing this bleak but compelling futuristic dystopia. A reality where total surveillance is used to control and suppress its citizens’ actions and thoughts, where even your nightmares are known. 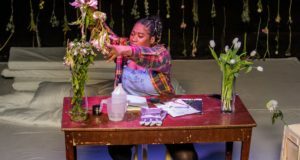 This co-production at the Almeida Theatre, with Headlong and Nottingham Playhouse, manages to remain faithful to the book’s terrifying vision. Yet it is the many original and contemporary touches that make it a definite must-see. 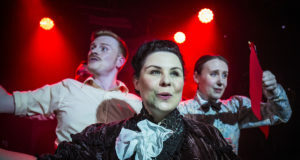 In their contemporary guises at the beginning and end of the play, the cast is a group of people from the year 2050. They are studying the 1984 diary of Winston Smith, a records clerk whose job it was to rewrite history in accordance with the party line. From there, we flash back to the story of Winston’s rebellion and his eventual capture and correction by the Thought Police (his ‘thoughtcrimes’ include thinking independent thoughts, writing a diary and a forbidden love affair). The question the play’s co-creators want us to ask is who is giving us Winston’s story and why? Winston also mysteriously appears as himself in the year 2050, but as yet unrecovered from the destruction of his individual impulses. Only in a distorted political ideology where “WAR IS PEACE” and “SLAVERY IS FREEDOM” can such contradictory interpretations be believed. This seems to relate ingeniously to Orwell’s own novelistic reflections on the nature of truth. 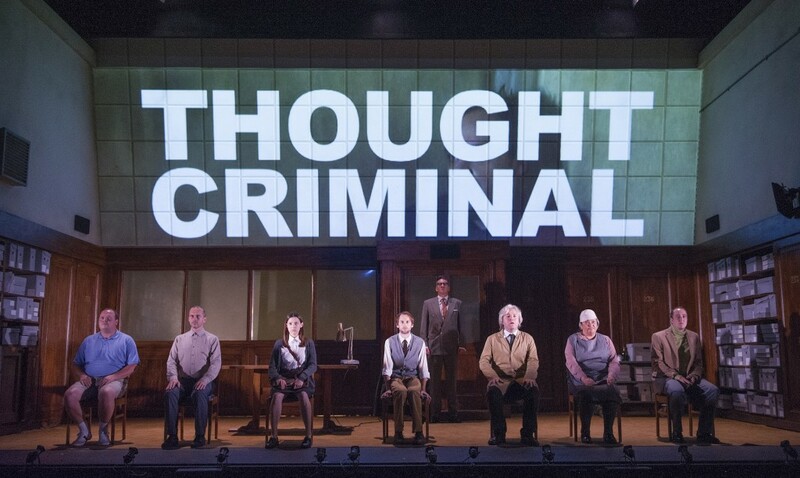 The set and the staging both work exquisitely to reveal the unreliability inherent in an authoritarian state. The retro wood-paneled library has glass screen and a telescreen that ensures everyone is watched always. Ghostly figures appear then disappear, with no knowing of what’s been recorded or reported. The actors move about dream-like and say odd things that reinforce the idea that what we see is as much a playing out of Winston’s distorted mind and paranoia. During the canteen scenes time is slowed down to imitate the mental habit of trying to observe others while feeling under threat. You never quite trust the vacant and harsh Julia, who declares her love for Winston but could at any moment expose him as Thought Criminal. In true reality TV style, the video scenes where we watch Winston and Julia in their romantic hideaway are ironically more real than the onstage action. Big Brother is watching too, and before long they are seized by the Thought Police. An impressive set change transports us to a blindingly white Room 101, the place of remorseless ‘reeducation’, where every impulse of individualist defiance is stamped out. It’s a place of annihilation, where the psychological manipulations used to alter Winston’s mind are just as terrifying as the physical torture. I did see many audience members (along with myself) turning away and wincing; Mark Arends as the suffering Winston was all too convincing. In case I haven’t dished out enough praise in this review, let me add that the Almeida is one of theatre’s glories. Having begun its life as a literary and scientific society, you could be forgiven for thinking it might be stuffy and insular. It isn’t. It’s modern, inviting and has a charm of its own. The stage is almost the size of the auditorium that, with its curved back wall, feels inclusive and intimate. What better location for a play that collapses the distinction between the thoughts in our head and what we see around us.